It appears that Ray Bradbury has truly lived by his own advice. The inimitable writer of dystopian science fiction classics, including The Martian Chronicles, Something Wicked This Way Comes, and Dandelion Wine turns 91 today. When Ray was 13, his family moved from Waukegan, Illinois to Los Angeles, California. There, even though he did not attend UCLA, he did make frequent visits to the Powell Library. It was at that library, on rented typewriters, that Bradbury wrote Fahrenheit 451. 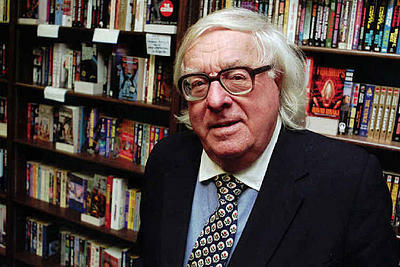 When he was just 18, Bradbury’s first science fiction short stories were published in fanzines. By the time he was 22, in 1942, he was being paid. A chance meeting with Christopher Isherwood got his manuscript for The Martian Chronicles into the proper hands. The adaptations of Ray Bradbury’s work are almost endless. His short stories and novels have been transformed into comic books, into television scripts (notably “I Sing the Body Electric” for The Twilight Zone) and into major motion pictures. All in all, Bradbury’s work has been transformed into thirty-five films and shorts. Bradbury continues to write and lecture. So think about that when you want to whine that something is too hard or you are too old. Happy birthday, rocket man.